Candies are sweet treats composed primarily of sugar and flavoring. They satisfy our cravings for sugar. Textures vary from rock hard to soft and gooey. Most candy is commercially produced, but some can be prepared at home. Holidays, especially Christmas and Valentine's Day, are perfect times to make homemade candies. The whole family can help create these luscious treats. Give them as gifts and wow your friends and family. 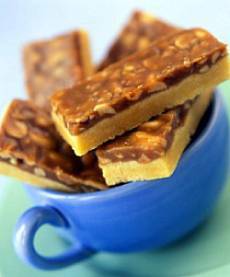 Most of the classic candies, such as fudges, fondants, caramels, toffees and brittles, are cooked candies. Cooked candies are formed from a boiling syrup made from sugar, a liquid, and a variety of ingredients for flavor. They are prepared the conventional way on the range top in a heavy saucepan and cooked to the proper temperature. Care should be taken when boiling syrup because the hot syrup can cause serious burns if spilled or spattered. FIRST, it is necessary to prevent large sugar crystals from forming since they cause the candy to become grainy and coarse in texture. To prevent large crystals, the sugar should be completely dissolved. Large crystals can form on the side of the saucepan; they should be washed down before a candy thermometer is placed in the pan. To wash down the crystals from the side of a pan, use a pastry brush dipped in hot water. Gently brush the crystals down into the syrup or collect them on the brush bristles. Dip the brush frequently in hot water to clean off the bristles. Another easy way to wash down crystals is to place a cover on the pan for 2 or 3 minutes. This allows the trapped steam to wash down the crystals. If you use the cover method, make sure the syrup does not boil over. SECOND, it is important to cook candy to the correct temperature. If you make cooked candy often, a candy thermometer is essential. Thermometers are available in cookware stores and some supermarkets. Test the accuracy of your candy thermometer before using. If a candy thermometer is not available, use the cold water test as described in the section titled "Cold Water Test." However, using a thermometer is much easier and more accurate. The proper use and testing for accuracy of candy thermometers are discussed in the section titled "Candy Thermometers." The shape, size and thickness of the pan will determine the time required for the syrup to reach its final temperature. Times given in recipes are only approximate. It is more important to refer to the temperatures of the syrups. Also, the temperatures are given in ranges. To achieve the proper consistency, the syrup must be heated to at least the minimum temperature without exceeding the higher temperature. Heating the syrup concentrates it. The longer the syrup is heated, the more liquid is evaporated and the more concentrated the syrup becomes. The higher the temperature, the firmer and more brittle the candy will be. THIRD, candies, such as fudges, must be cooled to lukewarm before they can be beaten and shaped. This cooling can take almost 2 hours for large fudge recipes, and patience is necessary. Do not place the hot candy mixture in the refrigerator or freezer to cool unless noted in the recipe. Heavy saucepans with flat bottoms will prevent candy from scorching during cooking. Pans should be large enough to prevent syrups from boiling and foaming over the rims. Always use the size pan suggested in the recipe and never double cooked-candy recipes. Place a small amount of the hot syrup into a cup of very cold, but not iced, water. Using your fingers, remove the cooled syrup. If the syrup has not reached the desired stage, continue cooking the candy and test again. The cooled syrup can be rolled into a soft ball that flattens when removed from water. The syrup can be rolled into a firm ball that does not flatten immediately when removed from water. The syrup can be rolled into a firm ball that gives some resistance when pressed. The syrup can be stretched into strands that are hard but elastic. The syrup forms strands that are hard and brittle and can easily be snapped in half. Candy thermometers are the most accurate way of determining the temperature of boiling syrup. Always attach the thermometer to the side of the pan after washing down sugar crystals. Make sure that the thermometer does not touch the bottom of the pan. Read the thermometer at eye level. Verify the accuracy of a candy thermometer by checking its reading in boiling water. Water normally boils at 212°F at sea level. If your thermometer does not read 212°F, either you do not live at sea level or your thermometer is not accurate. (Water always boils at a lower temperature above sea level because there is less air pressure.) To adjust the temperature given on a recipe, add or subtract the difference from 212°F as needed. For example, if your thermometer reads 210°F in boiling water and the recipe temperature is 240°F, cook the candy to 238°F, or 2°F less than the temperature stated in the recipe. Uncooked candies can be as rich and creamy as cooked candies. Truffles and nut clusters are examples of uncooked candies. The ingredients are mixed, then either shaped into balls, coated or pressed into pans or molds. Ingredients typically used for uncooked candies are fruits, nuts, sweetened condensed milk, evaporated milk, powdered sugar, marshmallows and extracts. Some uncooked candies are mixed and topped or coated with melted chocolate. While a heat source is needed to melt the chocolate, these candies are still considered uncooked. To prevent scorching, chocolate should be melted with care. It can be melted in a saucepan over direct heat at a very low setting, in a double boiler or in a microwave oven. See Chocolate for detailed melting directions. Butter, not margarine, should be used in most candy recipes to ensure the best texture and results. Butter also contributes flavor to candies. Today many margarines have added water to decrease the amount of fat they contain. Margarine-type products marked as "spreads" or those that come in tubs should not be used because their water content will cause melted chocolate to become stiff and grainy. Also, the added water will change cooking times for cooked candies. If you must use margarine, use only stick products labeled as margarine.